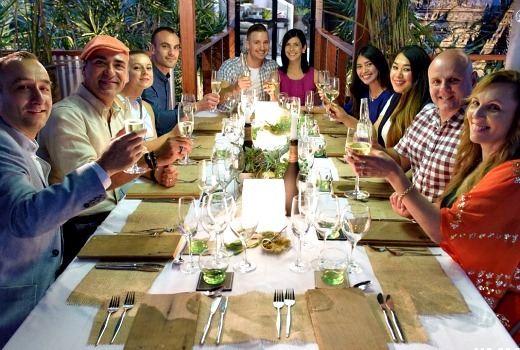 A new group of foodies -and a new villain- on My Kitchen Rules was the only show to crack the magic million last night (we’re starting early this year). It drew 1.54m viewers -at least half a million ahead of any other show on air last night and once again streets ahead of the competition. Seven had a winning streak right across primetime last night, securing its fourth night of the ratings week. Seven network share was 34.0% then Nine 26.3%, TEN 16.7%, ABC 16.4% and SBS 6.6%. Following MKR for Seven were Seven News (992,000 / 953,000), First Dates (877,000), Home and Away (850,000), The Chase (562,000 / 378,000) and Ramsay’s Hotel Hell (403,000). Nine News (904,000 / 892,000) led for Nine then A Current Affair (826,000), Big Bang (813,000 / 711,000), The Embassy (489,000) and Hot Seat (421,000). Movie: Olympus Has Fallen was 326,000. I’m A Celebrity Get Me Out of Here led for TEN with 691,000. The Project was 547,000 / 450,000 then TEN Eyewitness News (492,000) and Madam Secretary (383,000). The Good Wife was 246,000 and Hawaii Five-0 was 91,000. ABC News (788,000) topped ABC’s night followed by 7:30 (607,000), The Weekly with Charlie Pickering (517,000), Julia Zemiro’s Home Delivery (512,000), Adam Hills: The Last Leg Down Under (384,000) and Black Comedy (356,000). On SBS it was Tony Robinson’s Wild West (304,000), 24 Hours in Emergency (253,000), The Missing (138,000) and SBS World News (137,000). Shaun the Sheep was again tops on multichannels at 257,000. Ten continue to persevere with Madam Secretary and Good Wife despite continued woeful ratings year in, year out. Also, Black Comedy did not resonate with audiences last year and has flopped again this year on ABC with the show before it and the show after both scoring higher ratings. What else do they show, another NCIS repeat? I can’t believe The Missing is rating so poorly. It’s the best thing on FTA TV at the moment. The Good Wife is only rating 246k. And it isn’t over 12 months old having aired several times on cable and the DVD has probably been out for a while. It’s a great series. I gave it a push early on for those who haven’t seen it. I have said it many times but Ten need to address their 6-7.30pm offering if they want their prime time programs to work. I still say they had the right idea launching these at 7pm. The likes of TBL, Big Brother and Masterchef were more successful at a 7pm start. News from 7 & 9 deliver 1mil plus whilst the project has less than 500k. First Dates is the best car crash TV we have had in a long time. Ch7 have got the casting spot on for this one. It is a Twitter users delight! 877K average audience for the 9PM-10PM slot is incredible. If the content is right people will watch.